Observing the details of the world around him and encouraged by his parents, Tim was always drawing as a kid. His interest in storytelling probably started then, too, growing up in a small Kentucky town where everyone knew everyone else. The same kids who started first grade with him also filed across the stage with him in caps and gowns twelve years later. When it came to college, though, he was encouraged to head down a "practical" career path in engineering at Morehead State University. Not wanting to struggle with calculus for another year, he happily switched to art as a junior and eventually graduated with an MA degree. We're glad he chose the road less traveled, practical or not. At first Tim was not impressed with the required art history courses, but that naïve attitude "became history" when Titian, Rembrandt, and of course Sargent, paintings captured his attention. From then on he was hooked on the painted portrait (or as Tim often says "single figure narrative"). Soon paint, color, and texture opened the doors to archetypal stories of ancient saints, gods and goddesses. 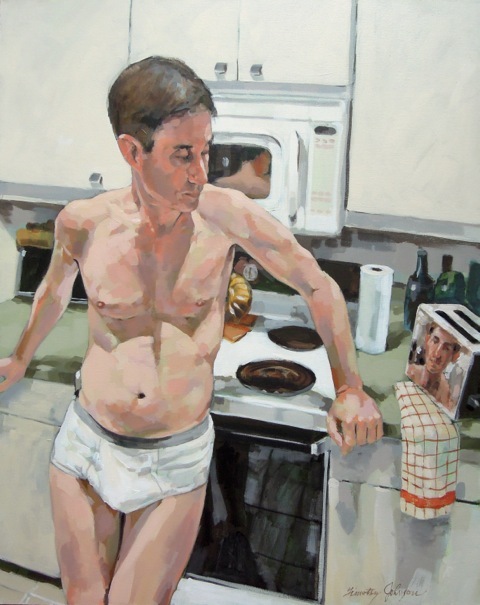 Tim's current work gives a contemporary twist to Greco-Roman mythological characters as expressed through the personalities of his friends and associates--or himself. Cramming the canvas full of narrative object-hints, he tells the stories of Persephone reentering the upper world to bring warmth and life back to the earth, Hades who imprisoned her in the cold underworld, and Narcissus mesmerized by his own image in a chrome toaster. Some of Tim's figures are perplexed while others show obvious discomfort or glee. Full of humor and irony, hubris and heartbreak, symbolism and sincerity, these portraits hold viewer attention and inevitably produce a smile. 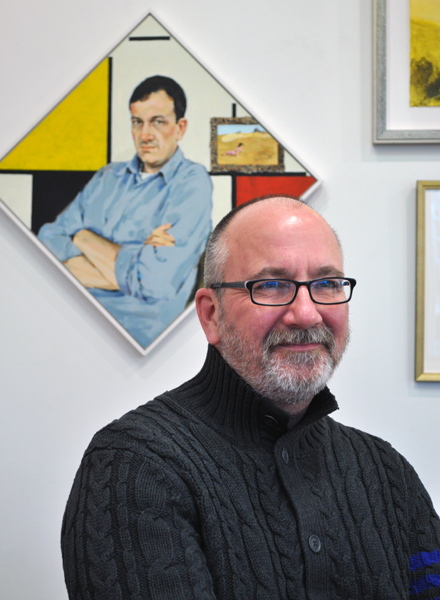 Timothy Johnson's new portrait series entitled, It's Greek to Me is currently on exhibit at Touchstone Gallery from March 1 to March 31, 2013. You can see him putting paint to canvas on most Saturdays and Sundays throughout March. Call 202-347-2787 for specific hours.